Most triathletes start as an avid participant in one of the three sports: running, biking or swimming. Maybe they decide the pounding on their joints is too much and so they expand their fitness beyond running. Or after cross-training on the bike, they realize they like to ride. Or perhaps they don't want to leave the pool after using it to recover from an injury. But the transition from training in multiple sports to becoming a multisport athlete can be difficult for some people. Andrew Kalley, USA Triathlon Level 2 coach and accomplished triathlete has seen and heard many myths or excuses about why someone can't do a triathlon, and he's trained dozens of people through these barriers. Anyone can learn to swim and most triathlon coaches can actually teach you the basic fundamentals of swimming in a few private lessons. I've actually trained people to swim and had them competing in an open water event in a matter of eight weeks! Also, keep in mind that any swim component of any race will have many certified lifeguards on duty to make sure all the swimmers are safe. 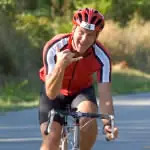 If you are just interested in the challenge of completing a triathlon, you can technically ride any bike in the race. Clearly, some bikes will make it significantly easier. There are many opportunities to purchase a good used racing bike. Talk to your coach, talk to others training—people are frequently looking to either upgrade their bike and sell an old one, or perhaps they even have an extra that you can borrow to train on. Another option is to rent a bike from a bike shop at your race destination—this way you don't have to pay to transport your bike to every race. Triathlons come in all lengths—some sprint races are as short as an hour. If you are worried about the time commitment, then start with a shorter race—no need to make your first race a 10-hour Ironman! Training can be integrated into your normal day. Bike to work or when doing simple errands. Get together with friends for a run or do your swim as an open water swim while relaxing at the beach on the weekend. Triathlons may seem confusing—three sports, lots of equipment, where to train, how to train, what to bring—but know that you aren't in it alone. Triathletes love sharing information and helping newbies into the sport. The best way to get started is to join a team. Let the coach walk you through picking the race, the distance and the equipment. He or she will be able to make that first race a great experience. Many people hear "triathlon" and think of the Ironman, wrongly assuming they could never do a triathlon—that they simply don't have the stamina and never will. However, there are actually many distances in triathlon—ranging from sprint (1/2-mile swim, 12-mile bike, 5K run) to a full Ironman (2.4-mile swim, 112-mile bike and 26.2-mile run). Multisport options also include duathlons (run/bike/run), aquathlons (swim/run/swim) and aquabikes (swim/bike). Working with a coach, you can enter a race that is just right for your level whether it be a sprint distance or an endurance race. Andrew Kalley has been a USA Triathlon Level 2 coach at the Sports Center at Chelsea Piers since 2006. In addition to his coaching duties, Kalley is an accomplished athlete, taking second overall in the 2009 Mighty Montauk, winning the 2008 West Point Triathlon, finishing third in the 2010 South Beach Triathlon, and winning his division in the 2009 USTA Club Nationals. Kalley is a head coach and a leading competitor on the Full Throttle Endurance Racing team, guiding them to three USA Triathlon National Team championships and back-to-back victories at the NYC Triathlon Team Challenge.